Fast text manipulation and data extraction. 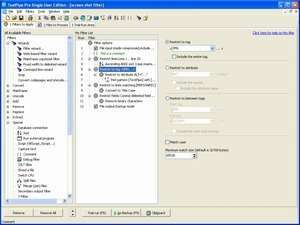 Fix websites, database extracts and electronic text with EasyPattern multi-line search and replace, convert end of line characters, ASCII-EBCDIC, OEM-ANSI, 150 Unicode conversions, Unicode search/replace, extract emails, add/remove lines/columns, add line numbers, sort, split, join, JScript/VBScript, restrict to line/column ranges and CSV/Tab-delimited fields. Winner SIA 2003 "Best Application". For security reasons, you should also check out the TextPipe Pro download at LO4D.com which includes virus and malware tests. Additional screenshots of this application download may be available, too.